Buhari's campaign train stormed Kano state on Thursday, January 31, in continuation of his reelection bid ahead of the forthcoming general elections - The president won election in the state with 1,903,999 votes in 2015 The governors of Zinder and Maradi from Niger Republic were among the dignitaries that attended the mega rally of President Muhammadu Buhari in Kano, Daily Trust reports. 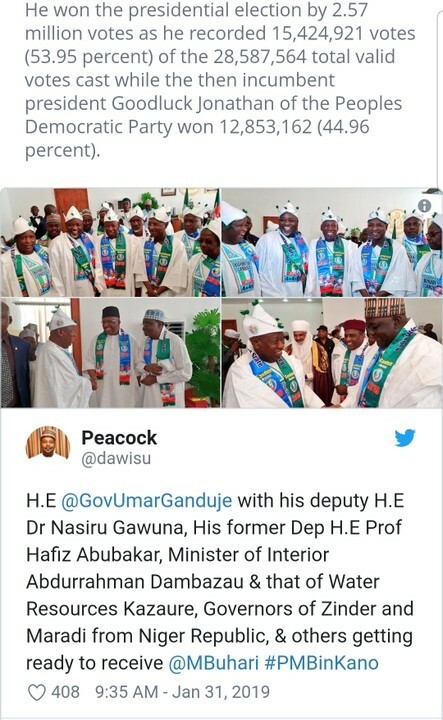 This was revealed in a tweet by Salihu Tanko Yakasai, the media aide of Governor Abdulahi Ganduje of Kano on Thursday, January 31. Legit.ng gathered that Buhari who is seeking a second term in office, won 1,903,999 votes in Kano state in 2015. It was gathered that Zinder, formerly also spelled Sinder, is the second largest city in Niger, with a population of 170,574; by 2005 its population was estimated to be over 200,000. It is situated 861 km east of the capital Niamey and 240 km north of the Nigerian city of Kano. Maradi is the third largest city in Niger and the administrative centre of Maradi region. It is seat of the Maradi department and an urban commune. It was reported that originally part of Katsina, a Hausa state, it became independent in the 19th century. From the early 19th century, Maradi was home to one of several Hausa traditional rump states, formed by rulers and nobility who fled the rise of the emirate.